How can I change the default Python version on Max OSX using macport? I am studying Google Compute Engine, this Infrastructure-as-a-Service (IaaS) permits you to run your large-scale computing workloads on Linux virtual machines hosted on Google’s infrastructure. This entry was posted in Open Source and tagged Mac OS X, MacPorts, Python on October 18, 2012 by Abdelkrim. Reading news about Document Management Systems brought me to a presentation of Microsoft SharePoint 2013. Initially I believed it was a screenshot of Facebook. This entry was posted in Web 2.0 and tagged 2013, Facebook, microsoft, SharePoint on October 16, 2012 by Abdelkrim. Chrome informed me that Hootsuite Hootlet has been disabled because it requires further access to my browsing activities. 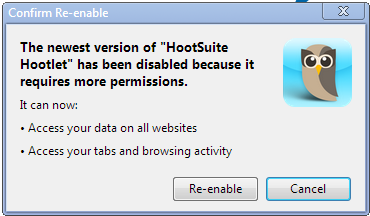 It should be nice that Hootsuite gives the finality of such request as I don’t use it actively. Is there a risk for my data privacy? accessing to all my browsing activities like checking my bank account is really mandatory for such tool? One conclusion: Google Chrome informs correctly the user if any extension wants to increase the amount of permissions it needs to fulfil its duty. This entry was posted in Data privacy, Web 2.0 and tagged Google Chrome, Hootsuite on October 9, 2012 by Abdelkrim.